The Citizens’ Constitutional Forum (CCF) made both oral and written submissions on Bill No. 28 of 2016 to the Parliamentary Standing Committee on Justice, Law and Human Rights yesterday at the Parliamentary Complex. In its submission, the CCF called for the removal of Section 24 of the Bill as it breaches core international conventions on ICCPR, ICESCR and is inconsistent with other provisions of the 2013 Constitution including Sections 18, 72, 73 and infringes on peoples’ right to freedom of speech, expression, or publication and freedom of assembly as guaranteed under the Bill of Rights. 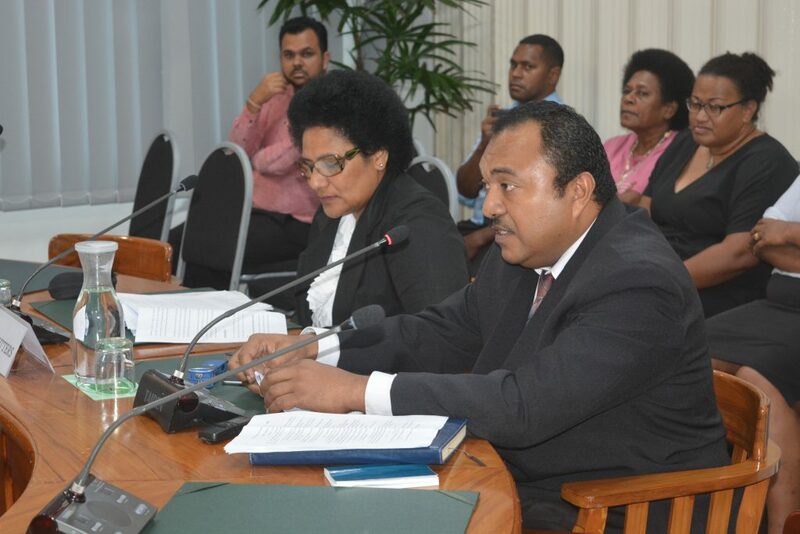 “Section 24 will further dissuade people from exercising their rights to critique Parliamentarians’ role and their performances for fear of being sued for defamation by Parliament,” said Mr. Bulutani Mataitawakilai, the Chief Executive Officer for CCF whilst delivering the submission. The CCF also called for the review of Section 23 so that it does not infringe on the people’s right to assembly under Section 18 and to be consistent with Section 72 of the Constitution. Mr. Mataitawakilai said that some sections of the Bill does not promote the trust as we aspire towards because in order to nurture trust; engagement with the citizenry, inclusiveness, sound and robust discussions and genuine political will are all essential ingredients in the functioning of a parliamentary democracy. “If the Bill No. 28 is passed as an Act, it could be used as a potential weapon by a future government to hound the opposition,” said the CEO. CEO Mr. Mataitawakilai was accompanied by Legal Officer Mrs. Meline Buadromo during the submissions at the Parliamentary Complex yesterday.